A fully-featured, extensible, free IDE (Integrated Development Environment) for creating modern applications for Android, iOS, Windows, as well as web applications and cloud services. 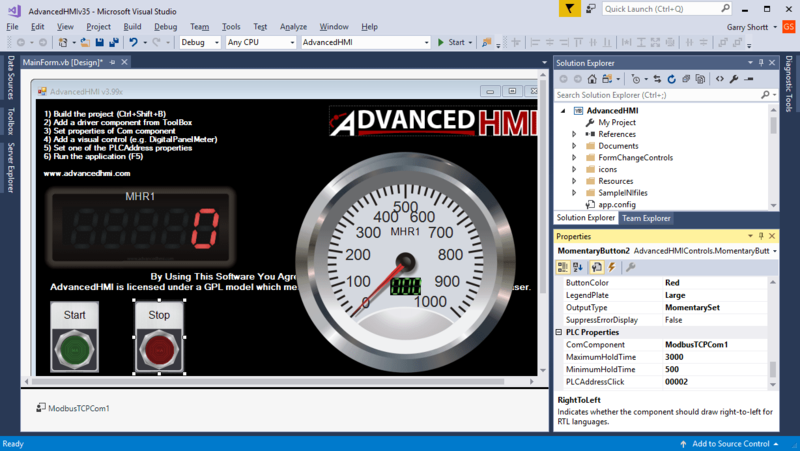 AdvancedHMI will run on this Visual Studio package. Download and install this from the link below. Here is a post that will guide you in installing visual studio. 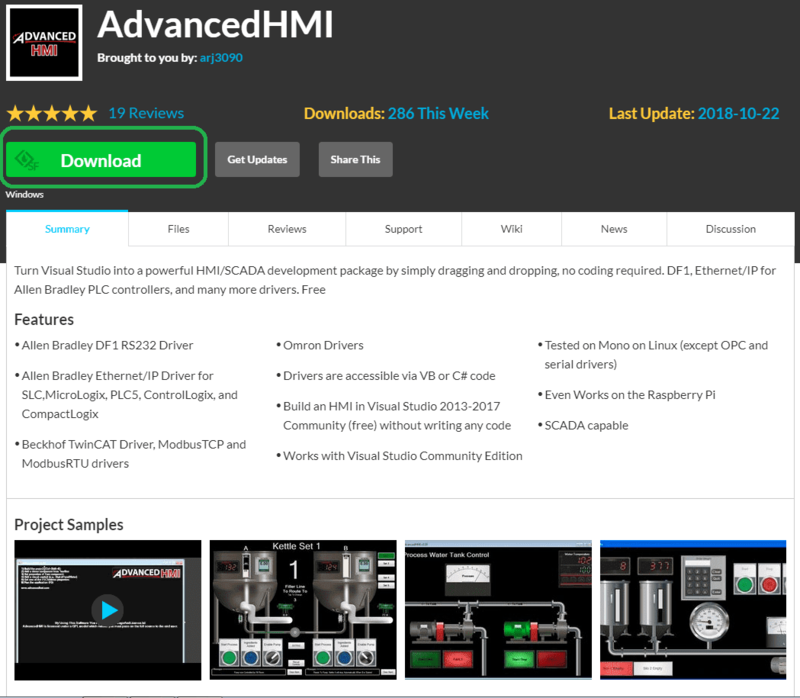 Download AdvancedHMI. The current version of the software is 3.99x. Watch the video below to see AdvancedHMI in action with the Productivity 1000 PLC. The following table shows the Coil/Register numbers and the associated Productivity 1000 PLC address for Modbus that we will set up. 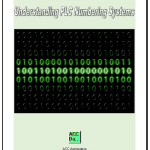 Note: The Productivity Series PLC allows us to specifiy the Modbus address to communicate. This is accomplished through the Tag Database in the Productivity Suite Software. 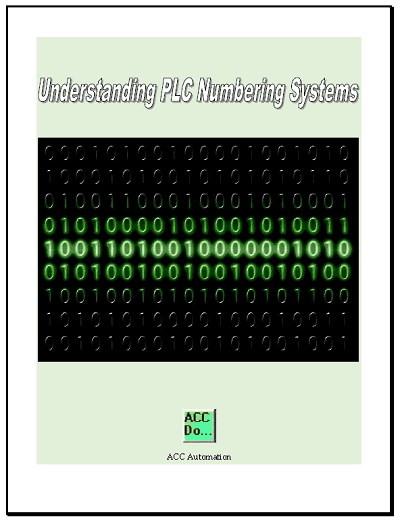 The following program will be used in the PLC to display and control our incrementing value in register MHR1. 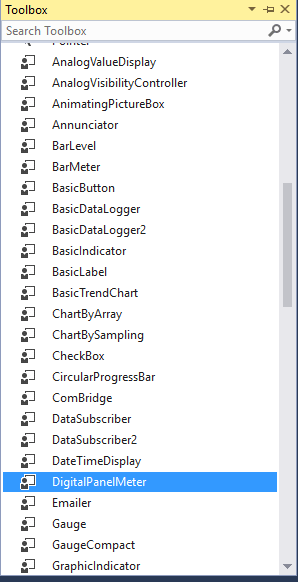 The following named tags are assigned through the Tag Database window. MHR1 is our incrementing value. This value will increment from 0 to 1000 and then reset back to 0 again. This is done every 100 msec on the done bit (STMR1.Done) of our simple timer instruction. Call up the Hardware Configuration window. This can be selected under the setup heading in the applications tools. You can also do this from the main menu | Setup | Hardware Config. Double click on the CPU module. This will call up the P1-540 window. Select the Ethernet Port tab in the window. 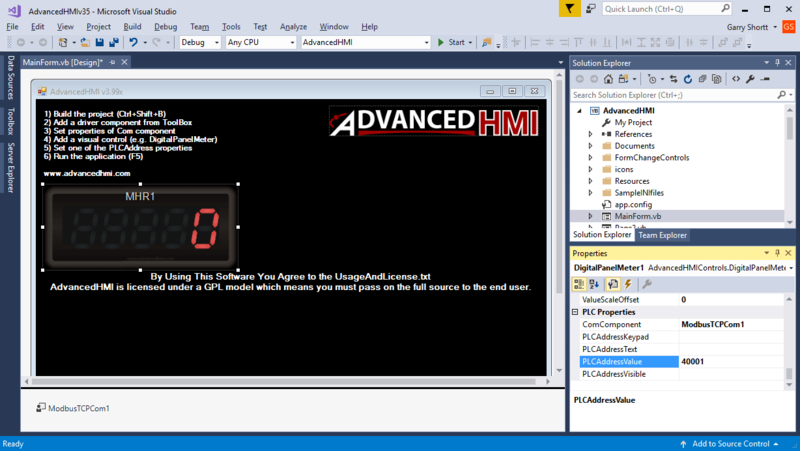 Now that we have our Productivity 1000 PLC configured and programmed we will now look at the steps for our HMI display using AdvancedHMI. Visual Studio must already be downloaded and installed on your computer from the link above. The project is similar to our BRX Series PLC AdvancedHMI Communication Modbus TCP that we have completed before. 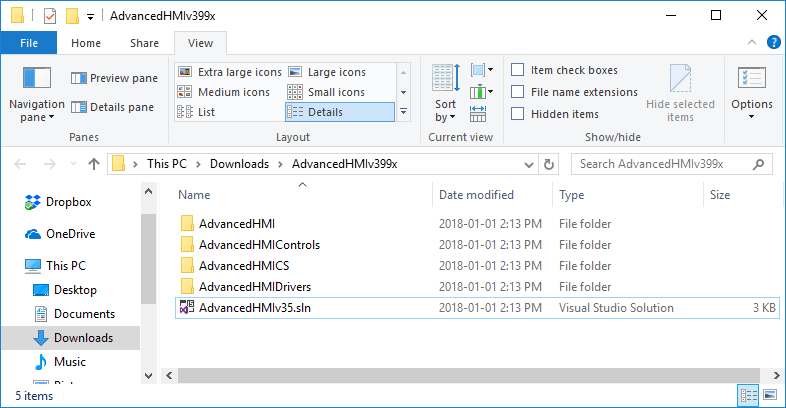 When we downloaded the AdvancedHMI software it was one file called AdvancedHMIv399x.zip. If you right click this file and select Extract All… , the files will be extracted. 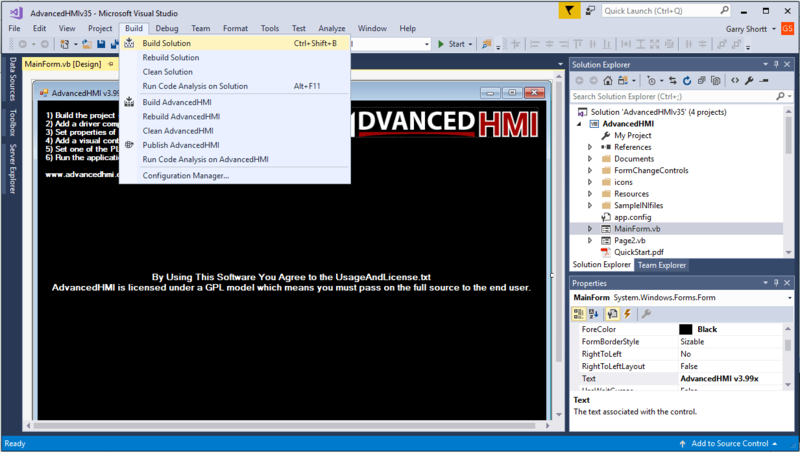 Double clicking on the AdvancedHMIv35.sln file will call up this programming software. You will notice that the screen is blank. The toolbox is empty. 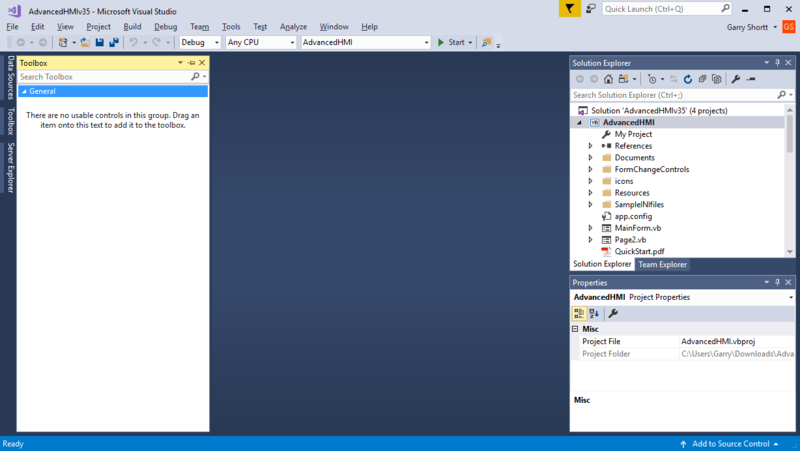 Call up the main screen by clicking on the MainForm.vb under the Solution Explorer. Notice that there are a six steps listed on this page to help guide you to building your HMI project. The first thing to do is build your solution. 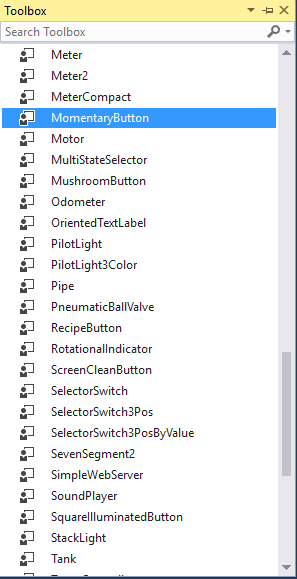 From the main menu select Build | Build Solution or use Ctrl + Shift + B. Output window will automatically appear and display the process of the build. When completed, you can close the output window by the X in the upper right corner of the Output window. 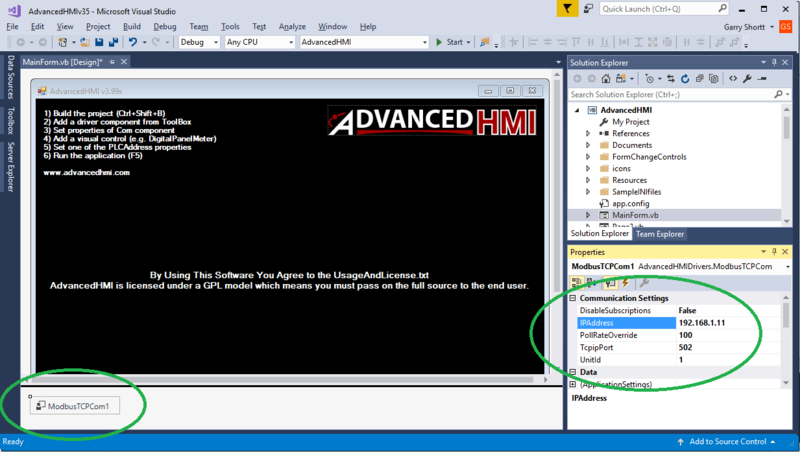 Your toolbox will now be populated with AdvancedHMI Drivers and Control components. Add the ModbusTCPCom1 driver from the toolbox. PollRateOverride – 100 (500 default) – This is the communication in msec that the program will communicate to the PLC. Let’s now add a digital panel meter from the toolbox. You select the control from the toolbox and place it on the main form. Here you can then resize the item by clicking and dragging the corner of the control. We will change the following properties on the DigitalPanelMeter. 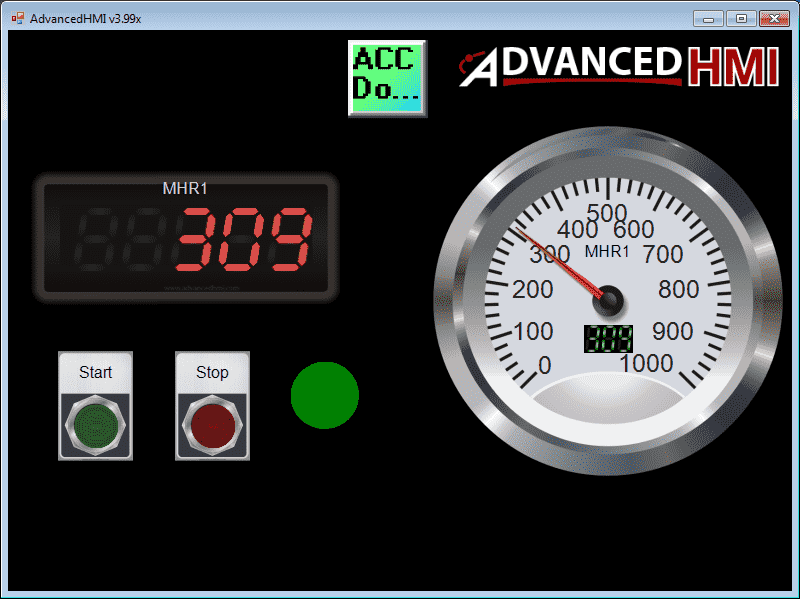 Text – MHR1 – This is the title on the digital panel meter. PLCAddressValue – 440001 – This is the address that is mapped to MHR1 register. 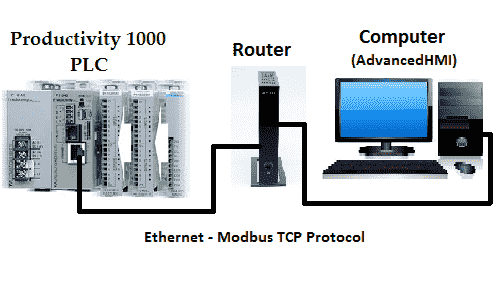 Verify ComComponent – ModbusTCPCom1 – This should be the default after the communication device is added. We will now add a gauge to our project from the toolbox. 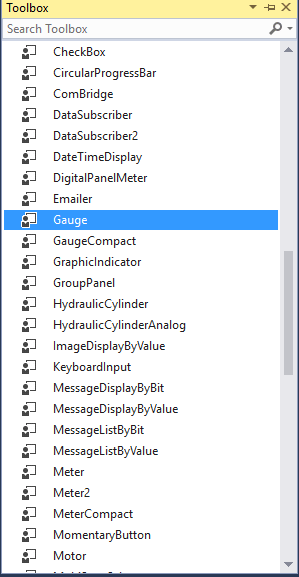 The following are the properties on the Gauge. Text – MHR1 – This is the title on the gauge. Maximum – 1000 – This is the maximum number that will be in register MHR1. Add two MomentaryButton’s onto the main screen from the toolbox. PLCAddressClick – 000001 – This is the address for MC1 coil. PLCAddressClick – 000002 – This is the address for MC2 coil. 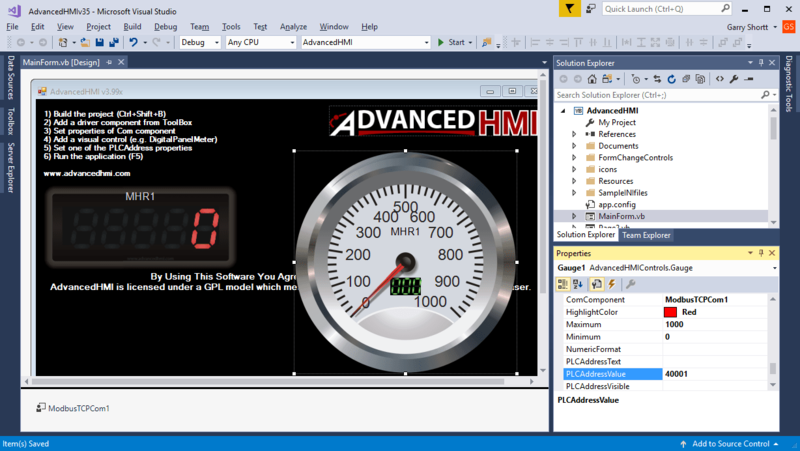 The last control component we will add to our AdvancedHMI screen is the BasicIndicator. 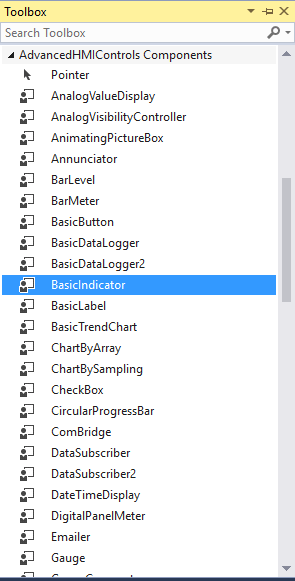 Here are the properties for the BasicIndicator. Text – ‘Blank’ – This is left blank so that no test is shown. PLCAddressSelectColor2 – 010001 – This is the address for Out1 coil. 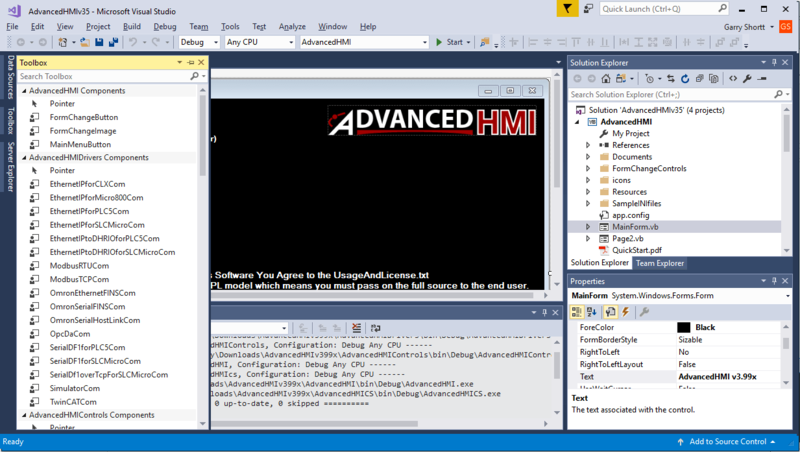 We now have our AdvancedHMI screen complete. Select the save icon or use the main menu | File | Save All to save our program. To run the program, select the start button. Ensure that we can start our program by forcing the contact be X1 on in our logic above. We can then click the start momentary button on our screen to start the process. 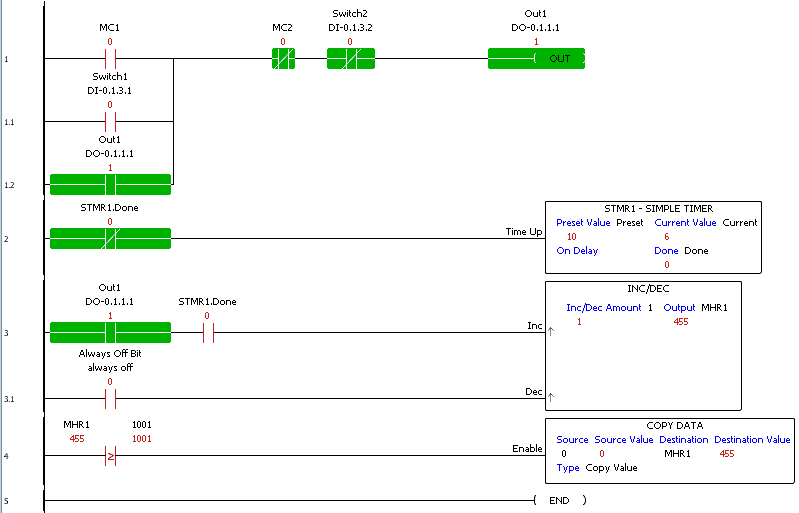 You will see the indication go from red to green when we start the incrementing of MHR1. The digital panel meter will display the value. The gauge will show you the value on the dial as well as the number in the center of it. 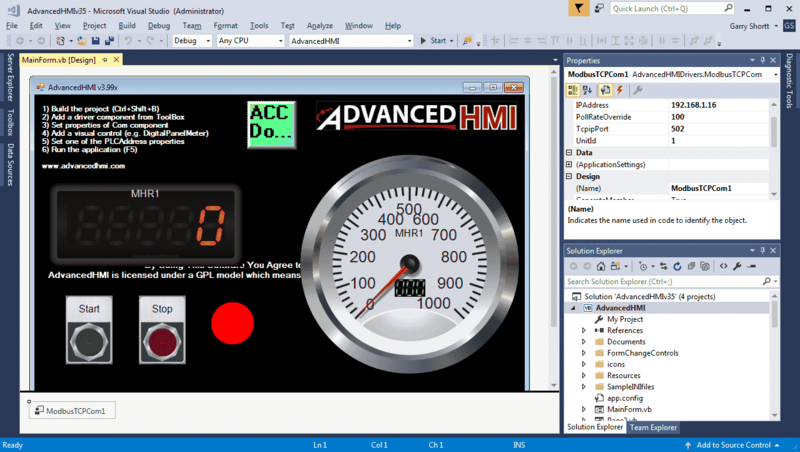 Stop and Start can be used on the HMI screen to start and stop the incrementing of the value. See the video below to watch our AdvancedHMI screen in action with our Productivity 1000 PLC. 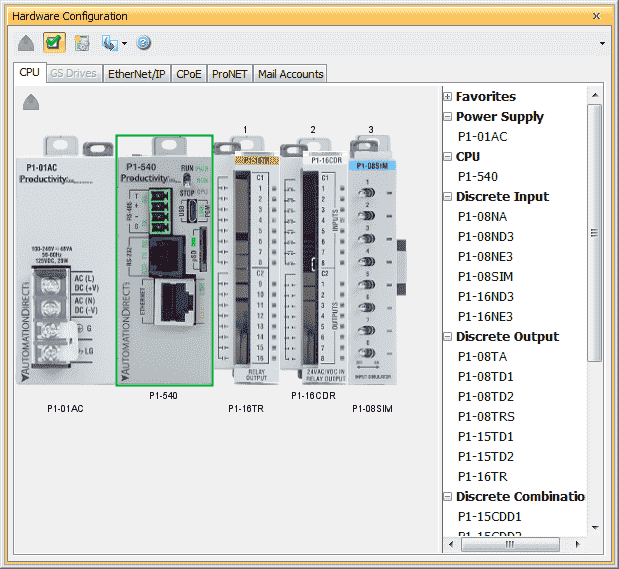 Download the AdvancedHMI and Productivity 1000 PLC programs here. Next time we will look at the Email instruction in the Productivity 1000 Series PLC.